The Royal Irish Yacht Club was founded early in the year 1846. 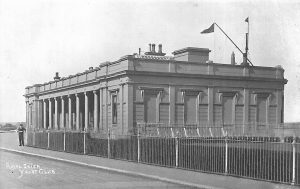 At a meeting of yachtsmen held in Dublin in the following year it was decided to move the club to Kingstown, and headquarters were taken at the Anglesey Arms Hotel, and remained there until the present club-house was finished in 1849.On July 23, 1846, the club received permission from Her Majesty Queen Victoria to use the title ‘Royal,’ and on August 10 following the Admiralty issued a warrant authorizing yachts of the club to fly the blue ensign of the fleet with a harp and crown in the fly, and a blue burgee with the same device. Her Majesty Queen Victoria, who was patron of the club, evinced great interest in Irish yacht-racing, and in the year 1848 ordered that a prize, to be called Her Majesty’s Plate, should be sailed for annually at Kingstown. The Lord Lieutenant at the time, the Earl of Clarendon, anxious to encourage sporting rivalry as much as possible, expressed a wish that the plate should be sailed for alternately at the annual regattas of the Royal Irish and Royal St. George Yacht Clubs. The officials of the two clubs met, and, by a cordial arrangement, the Viceroy’s suggestion was put into practice. A ‘toss up’ on the question of which club should have the initial race resulted in favour of the Royal St. George Club, and it was raced for at their annual regatta in that year. The Royal Irish Yacht Club at its foundation devoted some attention to the fisheries of Ireland. By one of its original rules yacht-owners were called upon to endeavour to procure information respecting these fisheries, and transmit the same to the secretary.The club-house of the Royal Irish Yacht Club was commenced in the year 1847, and finished in about two years. It is a handsome building, facing the harbour and opening on to a terrace which runs the whole length of the house. A second terrace gives access to the landing-stage and boat-slip. In the basement of the building there is a large boathouse for the storage of the boats of members.The club possesses a collection of oil-paintings and other pictures presented to it from time to time, and also portraits of some former officials and prominent members of the club.